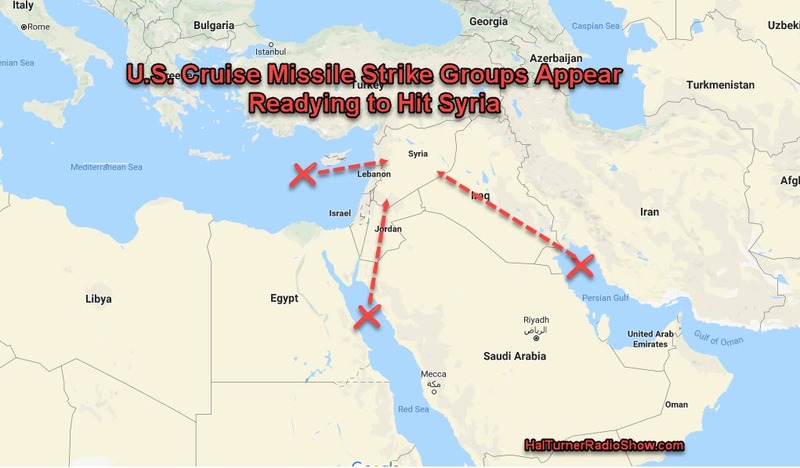 Why are there 3 U.S. cruise missile strike groups within striking range of Syria? More details as they become available. Please check back. . . The information directly above in this update is DISPUTED. The U.S. “usually” provides only ONE hour advance notice of military action in Syria. firstly it is CONFIRMED that France is requesting journalists to leave Syria. It is also CONFIRMED that the UN have been asked to move from Damascus. France CONFIRMED they HAVE asked to form a coalition to strike the Assad regime in response to chlorine attacks. It is DISPUTED that the US have informed Russia of any strikes in Syria at this time. Normal procedure is to give the Russian’s about 1 hour warning. There has been no warning yet. The carrier group in the region is on usual station; it is supposed to be there. That said, it is CONFIRMED that cruise missile equipped ships are indeed positioning in various places. It is also CONFIRMED there has been some deployment of bomber aircraft out of the USA. In sum, there is certainly some prep work going on but I don’t think the go signal has been given yet. That said, plenty of pieces moving on the board.